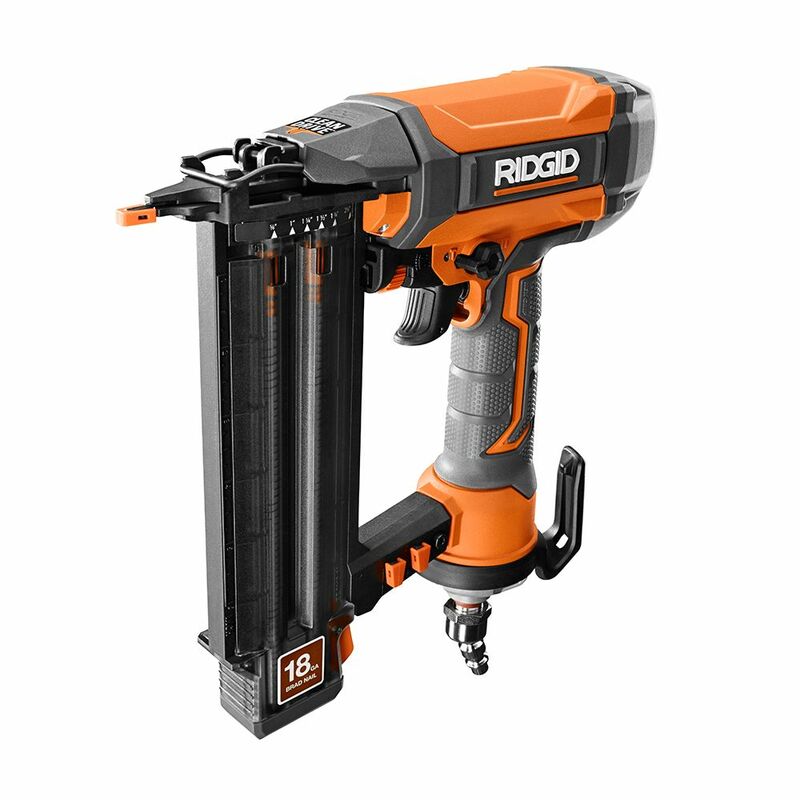 The RIDGID 18-Gauge 2-1/8-inch Brad Nailer features an industry leading feature set with Fasten Edge Technology. It has a selectable trigger that can be set to contact or sequential fire. The magazine allows a wide range of fastener lengths and the internal piston catch delivers consistent driving power. It is designed for clean operation and long life and equipped with no-mar pads that help prevent scuffing or damage to the work surface. The Freeman PBR50Q 2-inch 18-Gauge Brad Nailer is a professional quality, innovated home improvement tool. This brad nailer has a lightweight aluminum design and a tool-free adjustable exhaust that conveniently directs exhaust from your face, quick release nose for easy jamb clearing and tool-free depth adjust. The anodized aluminum cylinder provides a more durable surface when the piston is firing and retracting during use. This tool also comes equipped with Teflon O-rings which provide less wear and tear on cylinders and pistons ensuring longer life on internal wearable parts, one piece drive blade which reduces the risk of an internal failure and dual spring magazine which makes the Freeman nailer the obvious choice. The Freeman 18 gauge 2-inch Brad Nailer is great for interior and exterior finish and trim, furniture, cabinetry, crafts and hobbies. The Freeman 4-piece finishing/framing combo kit is a contractor's dream. This kit covers your framing to finishing needs and includes a 21-degree full head framing nailer (PFR2190), 34-degree 15-gauge angle finish nailer (PFN1564), 1-1/4 18-gauge brad nailer (PBR32), 1-1/4 18-gauge narrow crown stapler (PST9032), oil, wrenches, manuals and a copy of the Freeman 7-year limited warranty, all within a canvas carrying bag. Freeman pneumatic nailers are manufactured under strict guidelines to ensure professional-grade standards and are backed by a 7-year warranty, ensuring less wear and tear on the internal parts. The Husky DP 2-Inch 18-Gauge Brad Nailer is a professional quality, innovated home improvement tool. This brad nailer has a lightweight aluminum design and a tool-free adjustable exhaust that conveniently directs exhaust from your face, quick release nose for easy jamb clearing and tool-free depth adjust. The anodized aluminum cylinder provides a more durable surface when the piston is firing and retracting during use. This tool also comes equipped with Teflon O-rings which provide less wear and tear on cylinders and pistons ensuring longer life on internal wearable parts, one piece drive blade which reduces the risk of an internal failure and dual spring magazine. Great for interior and exterior finish and trim, furniture, cabinetry, crafts and hobbies. 2-1/8-inch 18-Gauge Brad Nailer The RIDGID 18-Gauge 2-1/8-inch Brad Nailer features an industry leading feature set with Fasten Edge Technology. It has a selectable trigger that can be set to contact or sequential fire. The magazine allows a wide range of fastener lengths and the internal piston catch delivers consistent driving power. It is designed for clean operation and long life and equipped with no-mar pads that help prevent scuffing or damage to the work surface. 2-1/8-inch 18-Gauge Brad Nailer is rated 4.6 out of 5 by 312. Rated 5 out of 5 by Roger from It’s great having my brad nailer to make nailing a... It’s great having my brad nailer to make nailing a lot quicker. Especially if you are putting up your new ceiling. Rated 5 out of 5 by John from I wish I bought his earlier. I nailed... I wish I bought his earlier. I nailed up all baseboard trim in my kitchen, hallway and pantry in about 10 minutes. Never used a nailer before it is simple to use but and did a great job. Rated 5 out of 5 by StanMan from Handled very well in all situations so far!! ... Handled very well in all situations so far!! Rated 5 out of 5 by Jojo from bought this for my son for his birthday .His dad... bought this for my son for his birthday .His dad has the same gun and he borrows it all the time. Great tool to have when doing some remodeling in your home. Rated 5 out of 5 by HomeDepotCustomer from Amazing!!... Amazing!! Rated 5 out of 5 by HomeDepotCustomer from Did what I got it for.... Did what I got it for. You're not serious!!!??? It is a pneumatic tool (air operated)!! !